Our newest HumanaNatura salad meal combines diverse natural vegetables with vitamin-rich cheese and one of the healthiest fish in the sea, and all notably in a very-low carbohydrate or ketogenic format (there are options below to add carbohydrates and reduce fats if you are not eating ketogenically). The result is a delicious and optimally healthy meal, which is always the case when we prepare meals the HumanaNatura way and follow HumanaNatura’s OurPlate healthy eating guidelines. Check out the meal photo and instructions below, and be sure to subscribe to follow our healthy meal and other informative natural health posts! This HumanaNatura meal begins with 120-250 grams (4-8 ounces) of wild-caught and cleaned calamari, seasoned with red and black pepper, which is pan-steamed for about five minutes on a small bed of diced shallot, garlic, and enough shredded cabbage to hold the fish above the water (see our Cooking With Steam Overview if you are new to food steaming). 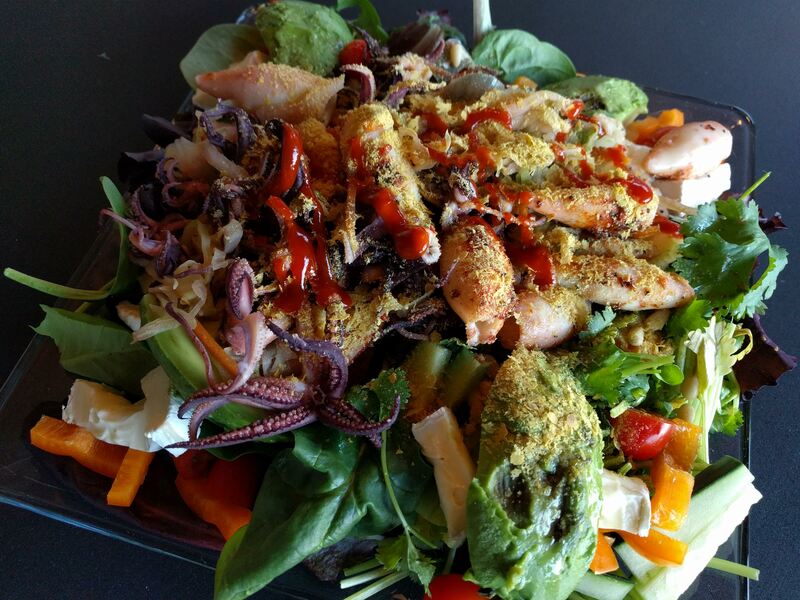 As the calamari pieces cook, a raw salad is prepared with mixed greens, a handful of chopped cilantro, slices of avocado, a small amount of sliced tomato and cucumber, some sliced orange bell pepper, a few pieces of brie cheese, and a dressing of olive oil and balsamic vinegar. When the fish is done, it is allowed to cool for a moment or two, and then added to the salad, along with the cooked veggies, as shown. Finally, the entire meal is garnished with black pepper, parsley flakes, a bit of nutritional yeast, and a small drizzle of chilli sauce, and then served promptly. If you want a higher carbohydrate and lower fat version of this meal, options include adding a bit of diced sweet potato to the steaming base and/or including a scattering of berries on top of the salad, and reducing the cheese, avocado, and olive oil (but avoiding grains, legumes, and added sugars, in keeping with HumanaNatura’s overall science-based paleo–phyto–keto approach to nutrition). In either case, a meal that is fast and easy to make, delicious, and healthy. This entry was posted on July 1, 2018, 01:00 and is filed under Natural Eating. You can follow any responses to this entry through RSS 2.0. You can leave a response, or trackback from your own site.